Athletics is a variety of competitive sports that is hugely popular throughout the world. The most popular athletics sports are track and field, road running, cross country running and speed walking. 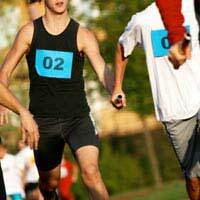 Athletics clubs are run throughout schools, leisure centers and local sports teams. Athletics clubs are great for learning a selection of different sports, meeting new people and enjoying a competitive atmosphere. In order to introduce athletics to new people, and help a new group feel at ease with one another, ice breaker games are an excellent idea. Incorporating the various sports in athletics with ice breaker games are extremely effective and enjoyable. Many athletics sports involve agility, strength, speed and coordination, which is why something like an obstacle course can be an excellent ice breaker game for athletes. Each obstacle can challenge the athlete and provide an excellent way of challenging each other and getting to know the sports involved and each other. Continuous training in a single sport can become tiring and monotonous, so setting up an obstacle course can be a welcomed change to the routine. As obstacle courses can include virtually any challenging task it can be tailored to the needs of the athlete or athletes. If the athlete is a sprint runner include a short dash at the end of the course. Or if the athlete is a long jumper include a task where the athlete has to jump over short obstacles. The obstacle course can be organised to meet specific needs, which is why it can be a great ice breaker game for athletics. One way of improving in athletics is to not only compete with others but to challenge and compete against the athlete. This can help the athlete push themselves and reach better athletic results. Each athlete can set a bench mark for themselves. One goal can be set for what they would like to achieve and one for what they feel can quite easily achieve. This should provide each athlete with a good scale of improvement and help the athlete visualise the goal ahead. This is a great ice breaker game for individuals and groups to interact with coaches and fellow athletes. Discussions between those involved can lead to motivation, enthusiasm and encouragement, which will again help improve each athlete in their sport. The other benefit of this ice breaker game idea is it adds a competitive edge to each session and encourages friendly competition amongst athletes, trying to out do each others goals. This can be an excellent way for everyone to try out different sports, compete against each other and adds some fun to training. Hold a mini Olympics that includes a selection of sports. Get each athlete to compete against each other and record the scores. At the end of the mini Olympics, supply a bonze, silver and gold medal to those who performed the best. To make it extra fun, include some podiums for the winners to stand on. This is a great ice breaker game event and will have all participants enjoying the occasion.